There appears to be a rich abundance of outstanding duo acts in the current UK folk scene, especially in the habitual male-female combination. These acts follow the exciting course of mixing traditional and contemporary pieces with a keen eye on maintaining the relevance of the key song through the ages. Kathryn Roberts and Sean Lakeman is a firmly established such duo and continually prompting the award giving bodies along with Gilmore-Roberts, Martin-Henry and Clarke-Walker. All four are forever seeking innovative ways to reach their audience, so it was far from surprising to see a gig spring up as a primary school fundraiser. The village of Cookley in North Worcestershire has a rich history of hosting folk music in various guises within its handful of locations. Kathryn and Sean were making their first visit to the area and by the reception the healthy gathering bestowed upon them it is unlikely to be their last. In fact the setting was right up the street of this parental duo which spends a large amount of time departing their Dartmoor base for shows up and down the land. Those present in the quaint school hall witnessed a pair of dovetailing artists exploiting their individual talents to the full while skirting around subjects as diverse as the blueprint murder ballad and the more sensitive side of intricate song writing. Kathryn is blessed with the most gorgeous vocal acumen you could wish to hear with Sean fuelling the theory of genetic brilliance. The evening kicked off with emerging West Midlands singing guitarist Sunjay playing a highly entertaining thirty minute set to not only warm the crowd up, but get the unique honour of a support slot encore. Witnessed as a musician who skilfully practices the art of pickin’ over strummin’, Sunjay switches between folk and blues in his style as well as adding a touch of populist humour to his stage presence. The heavily blues bias towards material from his upcoming new album was left on the shelf for this show as he concentrated on the job of playing the perfect warm up guy. This clever stance possibly eased more fans into the deeper psyche of his recorded output which doesn’t revolve around Herman Hermits’ covers. Matching his natural flair with stage maturity is a reasonable assessment for this in-demand artist equally adept at fulfilling the support or headline role. As with many fundraising evenings, the main act was punctuated with a strategic break to sell more raffle tickets and shift extra quantities of the adult refreshments brought into this adapted venue. This did not temper the flow of Kathryn and Sean who balanced each half with songs from their latest album TOMORROW WILL FOLLOW TODAY alongside a fair selection of their back catalogue. There was also a finely tuned spread of traditional and self-penned material ranging from the ever popular Child ballad to deeply personal original songs successful in spreading the intensity of their sentiment. ‘A Song to Live By’ is an outstanding example of the latter, one of a series of compelling songs graced by Kathryn's piano presence and further supplemented by the lyrics being available in a greeting card format at the merch table. As well as the aforementioned song and the Child ballad titled ‘Child Owlet, the highlight from the new album was ’52 Hertz’, a beautifully presented account of a whale in the North Pacific with a far from successful mating call. The stories behind the songs were as much as an enticing and engaging feature of the evening as the music itself and we were delightfully informed that the title track from the new album ‘Tomorrow Will Follow Today’ is a protest piece inspired by a segment from a Terry Pratchett novel. A further self-penned track acted as the encore number and ‘Wisdom of Standing Still’ proved an ideal closer with its self-reflective theme and perhaps the strongest melody driven track all evening. The art of folklore was rife all show with a gruesome Norwegian piece ‘Huldra’ putting fear into the male species as well as the graphic introduction to the Bury St. Edmonds murder ballad ‘The Red Barn’. ‘Lusty Smith’ was presented as an Appalachian folk song with an imported beginning, while ‘Joe Peel’, a song written by Peter Bond, was the most emotional of the evening with Kathryn responding to an audience request and supremely executing its delivery. While Kathryn gracefully moves between flute, clarinet and piano in addition to her vocals, Sean steadfastly engineers the guitar input in a less flamboyant style than his younger brother Seth. 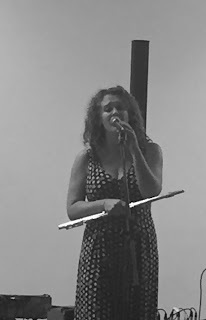 Kathryn appears to be the source of the original song writing with Sean keenly adding inter-song input to substantiate a generally lower key live presence. However acclaimed duos have an innate chemistry, with Kathryn and Sean adding credence to this notion. 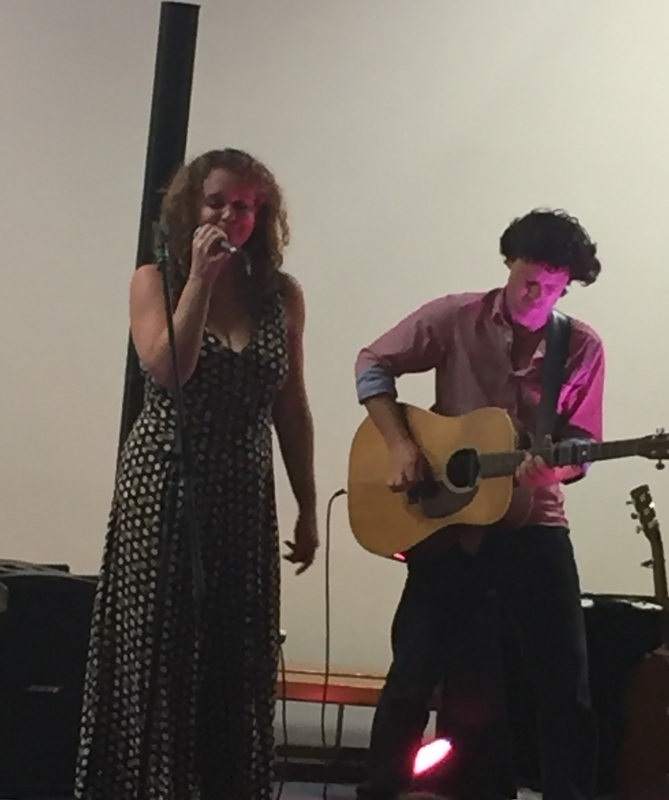 The Sebright Primary School in Cookley has hosted successful shows in the past and this Kathryn Roberts and Sean Lakeman gig is a worthy addition to the list. Enchanting, acutely interesting and magical song is the ideal strapline to add to a show from this duo who will continue to drive the live appeal of traditional and contemporary folk music well into the foreseeable future. Innovative venues will also long remain a substantial base to house live versions of the songs of our land, time, history and people.